The 23rd annual Kiki Konstantinos Scholarship Golf Tournament is scheduled for Tuesday, July 21, at the Little Mill Country Club in Marlton. Proceeds of the event fund scholarships for the outstanding graduates of the Lenape Regional High School District (Lenape, Shawnee, Cherokee and Seneca). The Konstantinos Scholarship Foundation was established in 1993 to honor former Lenape Regional High School District Superintendent, K. Kiki Konstantinos who served in the position for more than 30 years. Through this yearly golf tournament, the foundation raises money to continue Kiki’s work of fostering excellence in education by awarding individual scholarships to outstanding students for higher education. Currently, sixteen students per year are awarded a $2,000 scholarship, with a total of $425,000 being awarded since the establishment of the foundation. 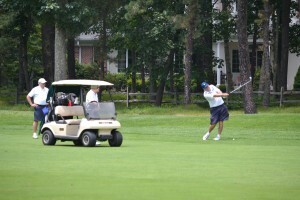 Cost per player is $210, which includes greens fee, cart, lunch, prizes and an awards dinner. Registration begins at 11:30 a.m. The golf portion of the event begins at 1:00 p.m. with a shotgun start. Those who are not able to golf but would like to be a part of this very worthwhile day, there are a wide range of sponsorships available. For more information, please visit the tournament’s website at: www.kikiopen.org, or call Steve Zeuli at (856) 985–5172 or Earl Siegman at (856) 983–0870.